May is the time of the Tulip Festival in Ottawa, they are everywhere! But it is also a major ramp up to summer and the announcement of the Artistic Director for the Indigenous Theatre at the NAC. Here are some of things that happened with Indigenous Theatre this month. Our Advisory Committee has been working together since last spring. Dave Jenniss, Jesse Wabegijig, Reneltta Arluk, Kenneth T. Williams and Elder Annie Smith St. Georges met this month to organize for the upcoming announcement of the new AD planned for June 15. Details are still being worked on and, at time of writing, the candidate for the position is still unknown. We are all hoping that we will be able to find out who this new leader will be on June 15. We will do our best to send more information as soon as we have it. Lesley Parlane attended The Recognize Workshop Series. This was a Toronto gathering organized by the Indigenous Performing Arts Alliance. The workshop was designed to: “share our findings on the process and protocols surrounding land acknowledgements. Over the past year we have been developing relationships with communities that are frequently recognized as original caretakers of what is now called Toronto. The day was devoted to exploring the complexities of land acknowledgements through conversation, art, and sharing.” The workshop was facilitated by Falen Johnson and a performances by The Six Nations Women’s Singers. Plains Cree Elder Pauline Shirt was in attendance to speak about stewardship and to give the opening and closing prayers to the day. Sarah Garton Stanley directed Brad Fraser’s Kill Me Now. 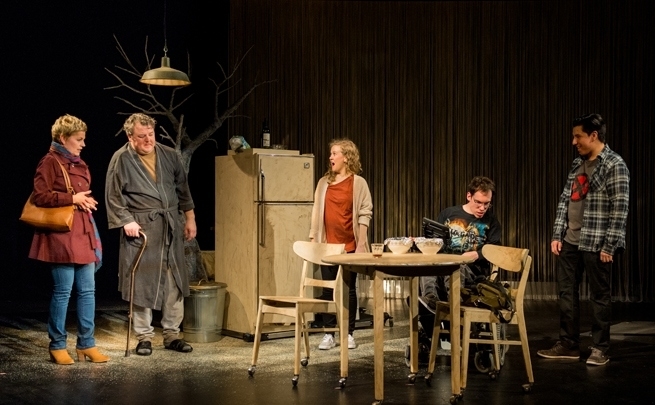 The show was an NAC English Theatre co-presentation of The Royal Manitoba Theatre Production. Braiden Houle, a First Nations actor from Winnipeg, MB, and a recent graduate of Studio 58 in Vancouver made his NAC debut. Before Vancouver, Braiden also trained at the Manitoba Theatre for Young People Aboriginal Arts Training and Mentorship Program. 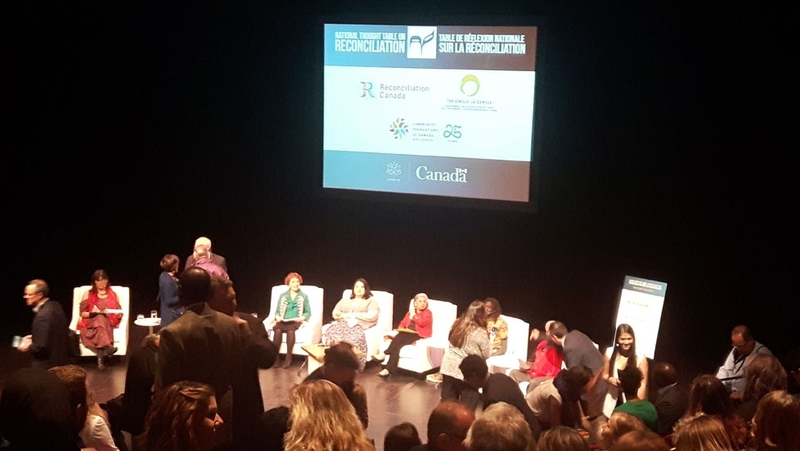 On Wednesday, May 10th in the NAC’s Studio the National Thought Table on Truth and Reconciliation took place. We were in attendance. It was moderated by Candy Palmater and with Thought Leaders: Chief Robert Joseph, O.B.C, Victoria Grant, ICD.D, Emmanuel Jal, Senator the Honourable Ratna Omidvar, C.M., O.Ont., The Honourable Perrin Beatty, Senator the Honourable Renée Dupuis, C.M., Ad. E. Post show; Lesley Parlane offered her thoughts on reconciliation for a soon to be released feature documentary about the event. Sarah Garton Stanley attended the 20th Annual Canadian Arts Summit, CultureNEXT, May 12-14, 2017 at Confederation Centre of the Arts, Charlottetown, PEI to speak as a panelist on Exploring Wise Practices: How can institutions foster authentic relationships with Indigenous artists? The session was moderated by Brian Calliou with Reneltta Arluk, Alan Greyeyes, and Michele Stanners and Mike deGagne also spoke. Lesley Parlane attended the International Society for Performing Arts(ISPA) 100th Congress in Montreal, QC. Inuit artist Elisapie Issac spoke about her challenges as an Inuit artist at the Conference. Sarah Garton Stanley attended The Professional Association of Canadian Theatre (PACT) in Charlottetown, PEI and spoke during an opening panel with Nina Lee Aquino (Factory Theatre) and Keith Barker (NEPA). Michele Decottignies and Cole Alvis continued their work (along with Donna-Michelle St Bernard) on the All IN initiative that was developed through the Equity, Diversity and Inclusion committee (EDI).